Some Instacart workers, still unhappy over changes to their pay, are threatening to strike during peak Thanksgiving shopping days. Meanwhile, the company is updating its software in order to make those changes more evident to consumers. Facing criticism from customers and threats of a strike from its on-demand workers, Instacart is rolling out a software update intended to better explain the recent changes it has made to the pay and tips earned by the people that pack and deliver the groceries on which it has built its business. The move follows unrest among some of Instacart’s on-demand workers, who are frustrated by a recent decline in take-home earnings, as well as by new contracts that include arbitration agreements that would preclude them from jointly suing the company. 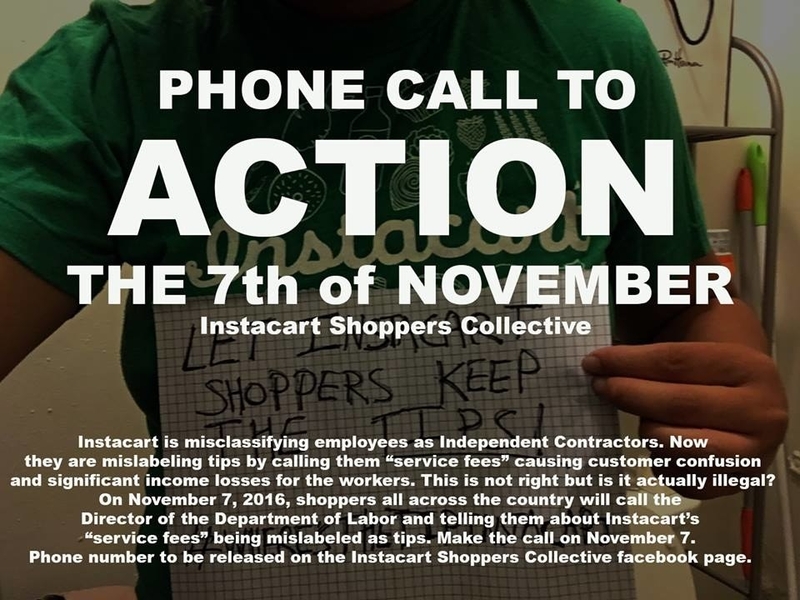 This growing coalition of Instacart workers is orchestrating a movement against the company via social media that includes calling in complaints to the Department of Labor and a possible strike intended to disrupt the company's delivery operations during two busy shopping days leading up to the Thanksgiving holiday. In September, Instacart changed how tipping works for the independent contractors — “full service shoppers” in Instacart parlance — who both shop for and deliver groceries to Instacart customers. Instead of defaulting to a tip that goes directly to the worker filling an individual order, the system now defaults to a service fee that is pooled among all Instacart workers, with the option to add an additional tip later on. Instacart had originally planned to kill tipping altogether, but outcry from workers — and customers, according to the company — caused them to alter course just before the changes rolled out. Workers who experienced a decline in wages were unsurprisingly upset by the loss in earnings, which they’ve estimated was around 30 to 40% of their Instacart income — a figure corroborated by a BuzzFeed News analysis of paystubs. Some reached out to Instacart customers to note that the change was hurting their livelihoods. “This service amount is not a tip, and won’t go directly to the shopper delivering your order,” reads a flyer that workers have been handing out to customers, which includes step by step directions to opt out of the service fee in favor of a tip. Some workers posting screenshots of their paystubs to two Instacart-themed Facebook groups say the tactic is working. Workers anecdotally report that they’ve received more tips recently than they did in the weeks immediately following the change. But not everyone is satisfied. In addition to mourning a decline in earnings, some Instacart workers are taking issue with the fact that Instacart is asking some of them to sign updated contracts, which reiterate Instacart's existing arbitration agreement. Instacart was the subject of a class-action lawsuit from workers last year, but the case was sent to individual arbitration. Arns Law Firm, which represented the workers, tried to get the case reconsidered, but on Thursday, the judge denied their motion. Uber, Lyft, Airbnb, and WeWork have all previously used arbitration clauses to evade class-action lawsuits. But Jonathan Davis, an attorney with Arns, said the new arbitration clause is a "different agreement with new language that impacts rights." It's unclear whether workers who opt out of the arbitration agreement will pursue a new class action lawsuit going in the future. The Instacart workers dismayed by the company's decisions regarding their compensation and legal rights are now working to orchestrate a strike on Nov. 22 and 23. Their stated goal is to jam up Instacart’s system in the days leading up to Thanksgiving. Organizers, some with experience working in movements including the Fight for $15, OUR Walmart, and Occupy Wall Street, are pushing workers to walk out on shifts to which they've committed or refuse to fill orders they've accepted in hopes of sending a pointed message to the grocery delivery service. "I am boycotting because my income is 25% of what it used to be." Danielle Gage is a shopper in Boulder, Colorado, who plans to participate in the Thanksgiving strike. "I am boycotting because my income is 25% of what it used to be. Now $8 an hour is a "good” day,” she said via email. "Every time I have told a customer how the new service fee works they were outraged and Instacart simply doesn't care." 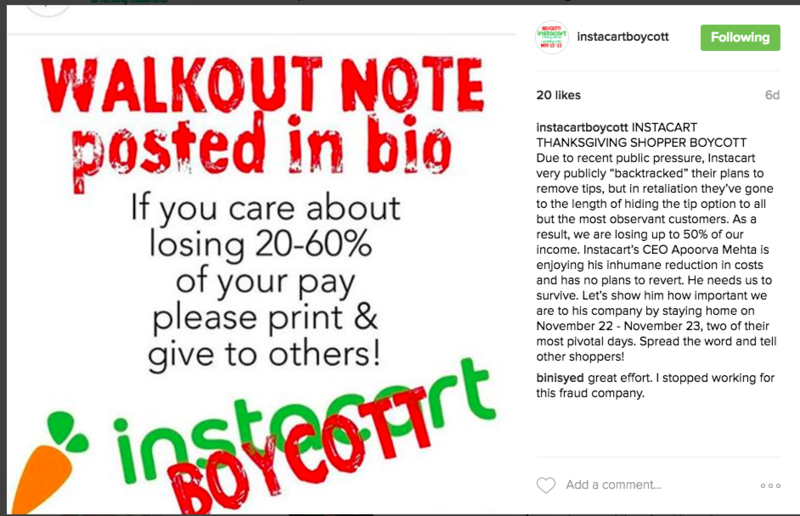 Instacart twice declined comment on the prospect of a pre-Thanksgiving boycott. Meanwhile, some Instacart customers are also voicing frustration, saying they were unaware of how the company’s shift to a pooled service fee would impact the people that pack and deliver their groceries. They argue Instacart should have done a better job explaining what was going on with tips. “I read the sentence that described the service fee three times,” Instacart customer Danielle DeRuiter-Williams told BuzzFeed News, “and I still couldn't figure out exactly what I was paying for, and how it was different from the tip.” DeRuiter-Williams said if Instacart doesn’t take steps to address the confusion, she would seriously considering leaving the platform. “I read what it said in the app, and I was confused." DeRuiter-Williams' complaint was echoed by other Instacart customers across Facebook and Twitter. Indeed, BuzzFeed News conducted an informal (and, yes, unscientific) survey of Instacart customers, to which around 5,000 people responded. The overwhelming majority reported that they were unaware of the changes the company had made to its tipping structure and how it had impacted Instacart's on-demand workers. Instacart told BuzzFeed News it has so far refrained from emailing customers about the change in tipping procedure because it claims very few customers actually open and read its emails. Instead, this week, the company has been gradually rolling out language in its checkout flow that says “NEW: We now use a service amount to pay the shoppers that work on your order.” The system still defaults to a 10% service fee, however, and there’s no specific mention of tips until you click on “Learn More.” Customers also have the opportunity to tip after the delivery is completed.